A U.S. Air Force F-15C Eagle fighter aircraft assigned to the 131st Expeditionary Fighter Squadron takes off during a theater security package deployment at Leeuwarden Air Base, Netherlands, April 11, 2016. The F-15s represented a theater security package rotation, which began in the European theater in 2015 to reassure NATO allies and partner nations of the U.S. commitment to the security and stability of Europe. 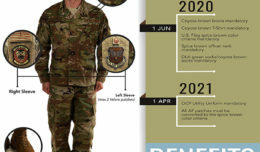 The units, under the designation of the 131st Expeditionary Fighter Squadron, along with airmen from Spangdahlem and Ramstein Air Bases in Germany, will operate as a theater security package to conduct training with NATO allies and partners. The TSP serves as part of Operation Atlantic Resolve, which aims to strengthen interoperability and demonstrate U.S. commitment to a Europe that is whole, free, at peace, secure, prosperous and able to deter aggression. 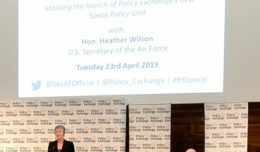 The general highlighted how the U.S. Air Force’s presence in Europe has declined from 25 major operating air bases to five and from 800 aircraft to just 200 while the number of allies and partners has grown within the last quarter century. A Belgian Air Force F-16 Fighting Falcon fighter aircraft takes off during Frisian Flag 2016 at Leeuwarden Air Base, Netherlands, April 11, 2016. More than 70 aircraft and personnel from the United States, Netherlands, Belgium, France, Finland, Poland, Norway, United Kingdom, Germany and Australia will participate in Frisian Flag 2016 at Leeuwarden April 11-22, 2016, with as many as 50 executing flight operations each day. 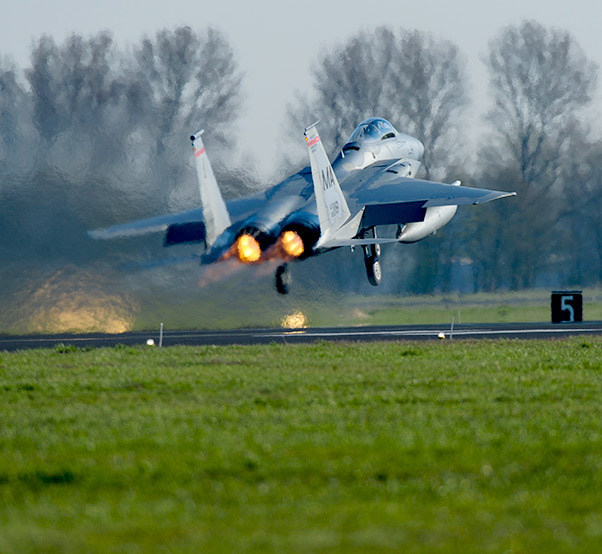 The eight F-15 Eagles will also participate in Frisian Flag 2016, a multilateral exercise hosted by the Royal Netherlands air force at Leeuwarden. This endeavor marks the second involvement between the U.S. Air Force and Frisian Flag under the scope of Operation Atlantic Resolve. Aircraft and personnel from the United States, Netherlands, Belgium, France, Finland, Poland, Norway, United Kingdom, Germany and Australia will participate in Frisian Flag 2016 at Leeuwarden April 11-22, with as many as 50 of the nations’ 70 aircraft executing flight operations each day. Leeuwarden has hosted Frisian Flag since the exercise’s inception in 1992. 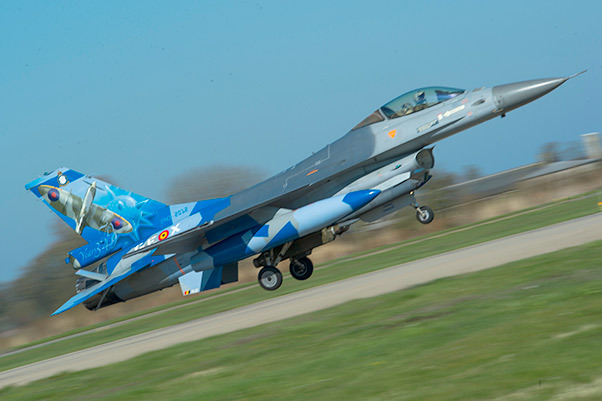 Royal Netherlands air force Col. Denny Traas, Leeuwarden Air Base commander and Frisian Flag 2016 host, said that the nature of modern warfare relies heavily on air power, operates with quicker reaction times and enables nations to work as partners within existing coalitions. Frisian Flag, he said, fulfills the requirement of meeting those demands and creating effective air forces. 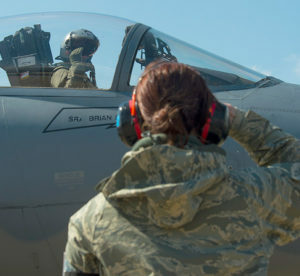 A1C Sarah Stec, a 104th Aircraft Maintenance Squadron crew chief with the Massachusetts Air National Guard, salutes a 131st Expeditionary Fighter Squadron F-15C Eagle fighter aircraft pilot in his cockpit during a theater security package deployment at Leeuwarden Air Base, Netherlands, April 12, 2016. The F-15s will conduct training alongside NATO allies to strengthen interoperability and to demonstrate U.S. commitment to the security and stability of Europe. The F-15s from the Massachusetts and California Air National Guard are deployed to Europe as part of the TSP. The goals behind the exercise also work within the overall objective of the theater security package, said U.S. Air Force and Massachusetts ANG Lt. Col. David Halasi-Kun, 131st EFS commander. Four 131st EFS F-15 Eagles remain at Keflavik, Republic of Iceland, to participate in Icelandic Air Surveillance. They will rejoin their squadron on the continent as the TSP deployment continues to reassure NATO allies and partner nations. 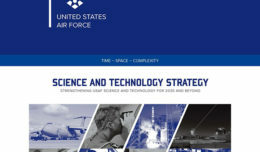 Rice also added how the theater security package has changed the way people should rethink how they view the term “total force” as it relates to active, guard and reserve capabilities.